Product prices and availability are accurate as of 2019-04-17 04:46:09 UTC and are subject to change. Any price and availability information displayed on http://www.amazon.com/ at the time of purchase will apply to the purchase of this product. The Swagman RV 4-bike bumper rack will safely transport up to 4 bikes. It is made of heavy duty solid steel construction and is built for a 4” – 4.5” continuously welded steel bumper. Simple and easy to use you will want to take this bumper rack with you on all your road trips. Not for use on aluminum or spot welded bumpers. Distance from bumper to end of rack: 34". First bike sits 4-3/4" out from bumper. 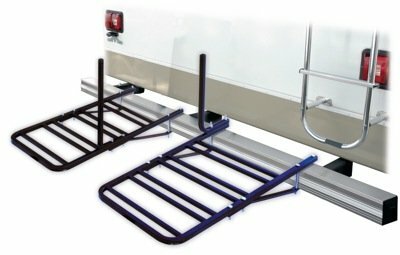 The 4-Bike RV Bumper Rack is covered under a Swagman limited lifetime warranty. The 4-Bike RV Bumper Rack provides an easy solution for carrying the whole family's bikes on the back of an RV. The sturdy rack mounts onto a 4 to 4.5-inch continuous, welded steel bumper and provides a platform where you can stand your bikes. The rack boasts solid steel construction and offers a weight capacity of 30 pounds per bike. 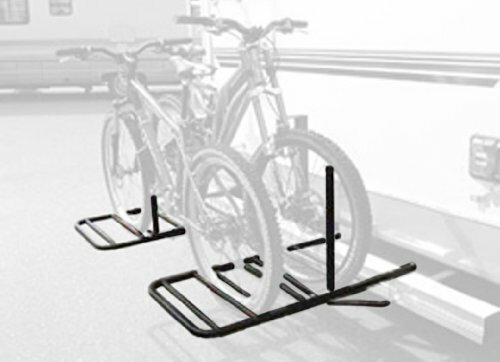 The RV Bumper Rack provides a stable platform to stand up to four bikes.